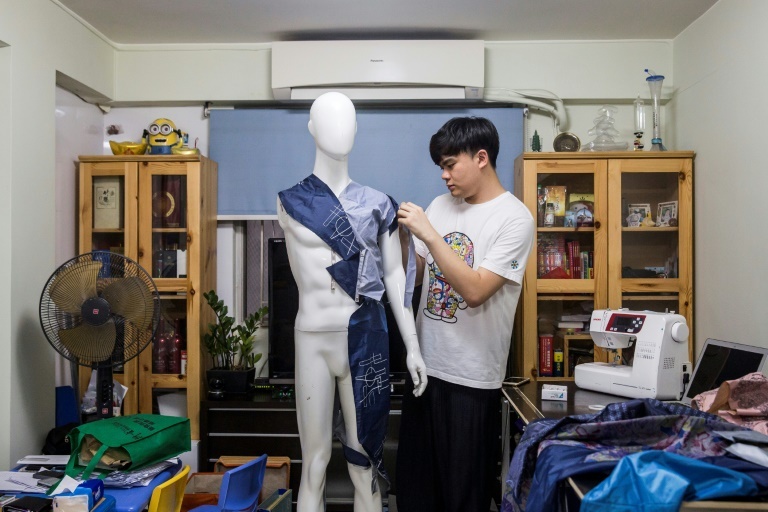 Despite Hong Kong’s reputation for rampant consumerism, a nascent movement against fast fashion is taking root in the city, with clothes-mending workshops and pop-up swaps growing in popularity, and designers parading recycled fabrics on the catwalk. From broken umbrellas to discarded curtains, no material is too shabby for designer Jesse Lee, who showcased his creations at a recent sustainable fashion show in Hong Kong. Lee realised that humble household goods could be the springboard for creativity when his family was throwing out an old sofa. He turned the sofa’s leather cover into a jacket and has since made clothes from old curtains and bed linen, as well as a raincoat using umbrella fabric. Lee also tries to make his designs unisex and adjustable so they can be easily shared. “If you don’t feel like wearing this, you can give it to others and it doesn’t matter if it is a boy or a girl,” Lee told AFP. Global consumers purchased 60 percent more clothing in 2016 than in 2000 and only kept each item half as long, a report by McKinsey consultancy found. Hong Kong alone sends 343 tonnes of textiles to the city’s overloaded landfills every day and a 2016 report by Greenpeace found a sixth of clothes owned by residents were seldom or never worn after purchase. But Lee and others like him are hoping to capitalise on rising consumer awareness as shoppers become more conscious of the human and environmental cost of fast fashion after high-profile scandals like the deadly 2013 collapse of a building in Bangladesh that housed several garment factories. The tragedy, one of the worst industrial accidents in modern history, sparked global outrage and triggered a drive among activists to encourage shoppers to buy from local stores, rather than from large multinational fast fashion brands. Christina Dean, founder of Redress, says the tide is slowly turning and describes the industry as at a tipping point. The Hong Kong-based charity works to reduce fashion waste and hosted the recent show where Lee displayed his creations, alongside other designers who transformed vintage kimonos and bridalwear samples and even used silicone and rubber. “Many people are turning their backs and saying ‘I have more clothes than I can possibly wear,” she told AFP. Shocked by the volume of clothing and the pollution produced by major brands, Hong Kong designers Kay Wong and Toby Crispy founded “Fashion Clinic” to help people mend garments. They set up pop-up stalls at clothing stores providing repair and reshaping services and also hold workshops teaching basic needlework. “Fast fashion makes people dispose of their clothes so easily, because clothes are too cheap and it seems to cost nothing to toss out the old ones,” Wong told AFP. “After they learn stitching, they can repair many things, like worn-out shirts or socks,” Wong said. Jack Lam, 31, was learning to sew patches onto his torn jeans at a recent workshop, as curious shoppers looked on. “The patches look like new embellishments,” he told AFP, adding that the jeans were now more valuable to him because he had fixed them himself. While repair clinics, clothes swaps and second-hand shops are all doing their bit, some want to address the waste problem on an industrial scale. A cutting-edge “upcycling” spinning mill that turns discarded clothes into new yarns will go into full operation in the city in October, developed by the Hong Kong Research Institute for Textiles and Apparel (HKRITA). The 1,765 square-metre (19,000 square-foot) factory will sterilise, sort and turn used textiles into fresh fibre, processing three tonnes of textile waste each day. Six workers will remove zips and buttons and categorise the fabrics before machines carry out automated colour sorting and re-spinning. Mixed-fibre clothing will go through a high-tech treatment to separate the different elements. Edwin Keh, CEO of HKRITA, said the recycled yarn will be “as good as virgin materials”, while the selling price will be 30 percent lower. The factory launch comes as mainland China moves to ban the import of most solid waste, including textile scraps, putting pressure on Hong Kong to find new ways to deal with its trash. “Whereas China doesn’t want to import other people’s rubbish, they are very happy with importing yarns and fibres, so that’s what we are going to do,” Keh said. Keh hopes the new mill will serve as an inspiration for other cities.